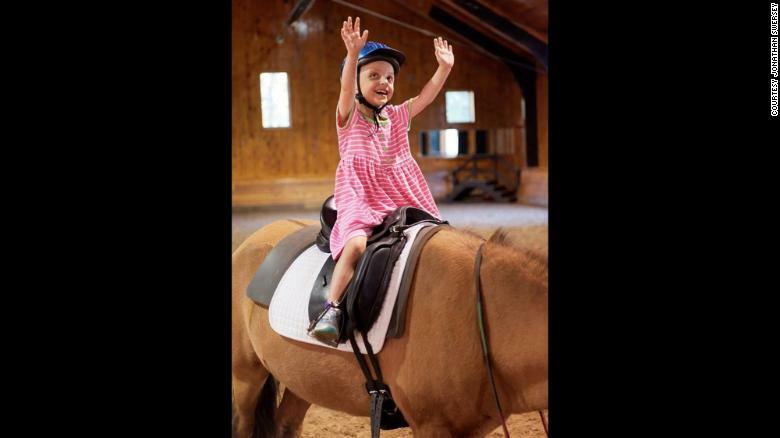 “Horseback riding helps me forget about my cancer. It’s fun,” said Belle, of Newton, Massachusetts. Belle’s dad, Jonathan Swersey, was skeptical of the practice at first. But he soon realized that it was transforming his daughter’s ability to cope with the side effects of chemotherapy and radiation. Seven-year-old Belle Swersey on her first day of riding lessons at Friends for Tomorrow in Lincoln, Massachusetts. “It’s helped her a lot with pain management. When Belle started, she was taking oxycodone, and the oxycodone was really ineffective for her pain. It was really incredible to watch her riding a horse for the first time. She had no sense of pain whatsoever,” Swersey said. The therapeutic benefits of horseback riding have been referenced since antiquity. In the fifth century BC, the Greek physician Hippocrates — namesake of the Hippocratic oath — wrote a thesis called “Natural Exercise” that references the therapeutic value of horseback riding, according to the American Hippotherapy Association. “There’s not evidence that equine-assisted therapy is dangerous or doesn’t work; there just isn’t evidence that it does,” said Anestis, who authored a 2014 study on the topic. “If somebody goes through equine-assisted psychotherapy and they get better, awesome. I’m happy for them. My career does not hinge upon this working or not working. I just want people to get better,” he added. The lack of evidence may stem, in part, from a lack of common terminology. A number of practices are often referred to as “equine therapy,” including therapeutic horseback riding, equine-assisted psychotherapy and equine-assisted activities such as horse grooming and stable management. “Part of the problem is that they’re so diverse, and some trials cite things that aren’t actually the same thing as what they’re doing. What even is this treatment?” Anestis said. ” ‘Equine-assisted activities and therapies’ is an umbrella term, and all of the different types [of activities] fall underneath our umbrella,” Marks said. In 2016, PATH-certified centers served over 66,000 individuals around the world, including over 6,000 US veterans, according to the organization’s 2016 fact sheet. “PATH International is known for our standards for certification and accreditation. They cover everything from best practices in safety to business practices in management to humane treatment of animals,” Marks said. Insurance does not normally cover these services. TRICARE — which provides health benefits to members of the military, veterans and their families — has covered hippotherapy in some cases, according to Marks. But upcoming research could convince other insurers to cover it, too. “The new research is going to change everything for us. Once that starts happening and we get more medical providers that are on board and they talk to insurance companies, I think something might really happen,” she said. “Veterans do really well with equine-assisted activities. Same with at-risk youth. It gives them a lot of self-confidence. It gives autistic children a lot of self-confidence, too,” Garver said. “It’s also good for people that have motor disorders: cerebral palsy, tic disorders. I think it has a lot of ramifications for many different disabilities,” she added. Garver’s study followed 20 children with autism over six months of equine-assisted activities such as horseback riding. The children’s average score on the Childhood Autism Rating Scale dropped from 37 at the beginning of the study to 34 at the end. “Autism consists of social/communication disorders and behavioral/sensory disorders,” Garver said. “They can also have restricted or repetitive interests. And a horse can feed into that because they’re very repetitive and always have the same gait. “I have a number of kids that ride, and it just seems to really relax them,” she added. But despite these promising results, the study suffered from a number of limitations — particularly, the lack of a randomized control group. By comparison, hippotherapy is a specific type of intervention in which physical therapists, recreational therapists, occupational therapists or speech and language pathologists use the movement of the horse to improve the rider’s posture, balance, coordination, strength and sensorimotor systems. Hippotherapy is thought to improve symptoms of cerebral palsy — such as poor coordination, stiff muscles and muscle weakness — by stimulating many of the muscles used in coordinated movements. The gait of the horse is also thought to mimic the rhythm of a human walking, according to Marks. In 2017, the Horses and Humans Research Foundation raised nearly $200,000 to fund research advancing knowledge of horses and their potential to affect health and well-being, according to the foundation’s website. “This is by far the most well-designed clinical trial of equine-assisted psychotherapy I’ve seen,” Anestis said of the study. “In our situation, we were willing to try anything that might help,” Belle’s father said. “And I think it’s been shocking and so wonderful to see how effective it’s been. Esta entrada se ha publicado en Artículo, Cosas Nuevas, Efectos Secundarios, Prevención, Sabías que, Salud, Vale la pena ver y se ha etiquetado como autismo, dolor, equitación, equitación terapéutica, estrés postraumático, medicación, terapia asistida. Marca el vínculo permanente.